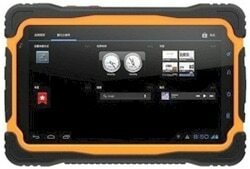 The BWC ToughSlate 7″ is a waterproof and dustproof rugged Android tablet with NFC. The durable device meets the IP67 standard and boasts a 7-inch 1024 by 600 pixel touchscreen. Powered by a 1GHz quad core MTK6589 from MediaTek, the unit runs Android 4.2.2 and includes Bluetooth 4.0, 3G and WiFi connectivity. The ToughSlate 7″ is available now at £499 (US$806).